The main difficulties I have with the “falling incomes” argument is that the country has changed dramatically over the past few generations and people are often unclear about what they mean by this. Families (and thus households) are substantially smaller than before because younger generations are less likely to get and stay married and because they have fewer children when they do. 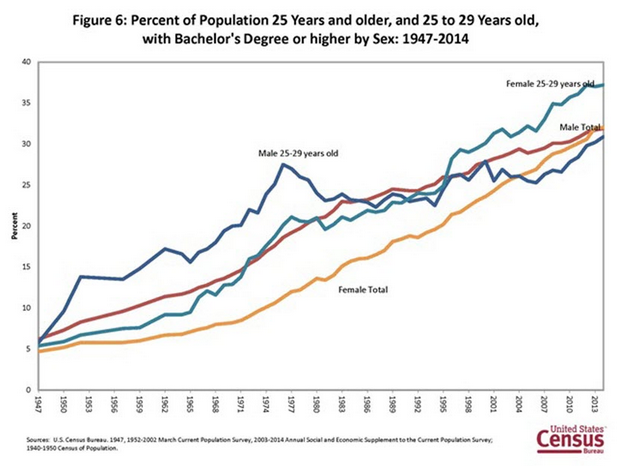 There has been a marked increase in education credential attainment. Comparing a HS (only) grad from 1960 to 2015 doesn’t make much sense. Thus when we talk about directional changes in income it’s important to understand what we are actually concerned with. 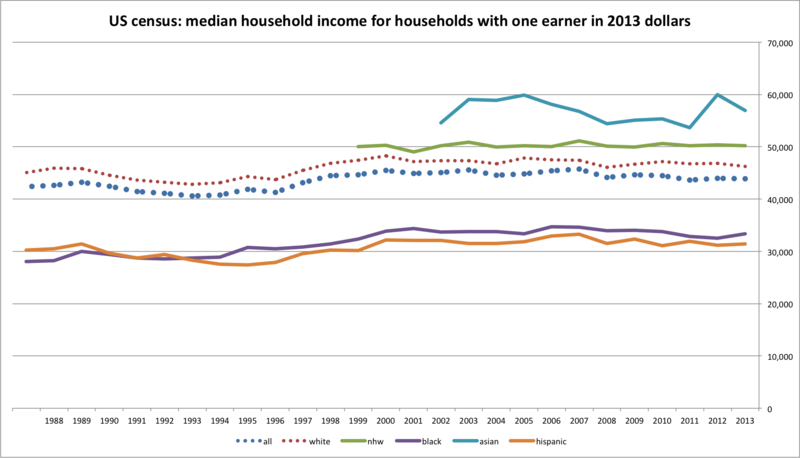 Is it more along the lines of “the same groups in the same job working the same number of hours are earning less in real dollars” (i.e., people are getting paid less for the same sorts of efforts) or is it a broader statement like “households have less income than they did generations ago” (regardless of work, household size, race/ethnicity, gender, etc)? The latter category is much easier to argue than the former. We can pretty clearly see that later generations generally better off as compared to their counterparts of similar ages in prior decades, even without conditioning this on work force participation, education, household size, etc. Household incomes have been relatively sluggish since the dot-com bubble burst, but that is still very long way from actually being poorer in real terms than their counterparts were in the 50s, 60s, 70s, etc. This analysis gets a bit more complicated when you look at this purely in terms of “education” levels (without looking at race/ethnicity, workforce participation, etc). It does look like relatively uneducated groups are doing worse than they once did. I think there is probably some truth to this, but it’s also much overstated by changes in the characteristics of these credential groups. 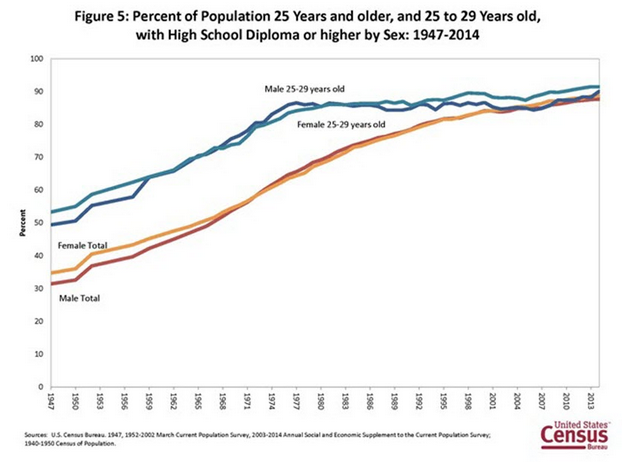 People with less than HS degrees, for example, represent a much lower place in the ability distribution today than it did in earlier generations when many people did not worry much about education. These less credentialed groups are also lean much more heavily black and latinos than they used to, which further skews the income data. Relative to a peak in the 70s, average male (personal) income is down somewhat. The picture looks a lot different once you break it down by race/ethnicity though. Much of this has been driven by larger numbers of males leaving the work force entirely. If you look at this data by actual employment status, it’s quite apparent that most people that are actually working are earning more. note: this should say less than 50 weeks a year, not 52! There has been a pronounced change here. Married families are more likely to be more fully employed than they once were, but there are substantially more unmarried families (especially female-headed). The family household composition change necessarily changes the income distribution and creates more apparent “inequality” when looked at from the household or family perspective. There has not been a large increase in the number of workers per family overall though. Quite the contrary, the number of families with no earners has increased and the number of families with large numbers of families with extra earners has declined overall. 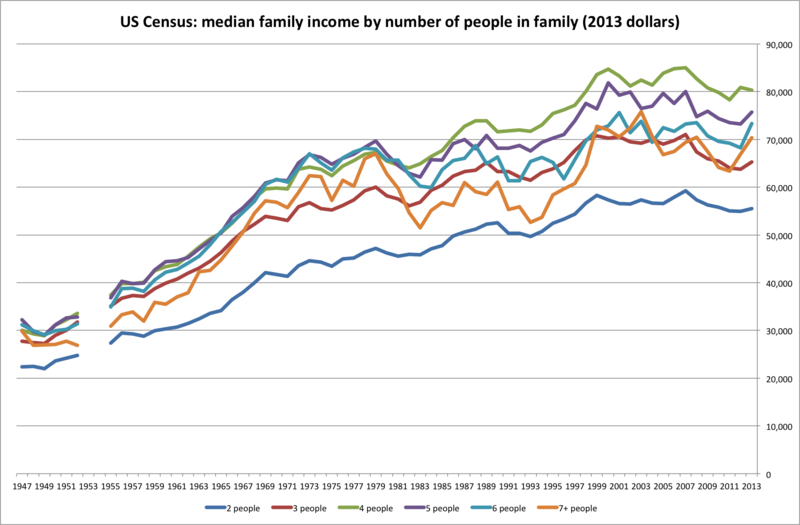 Data by number of people (not earners) per household….